"Cirque Eloize - iD" sets the tone from the moment you walk into The Wang. Sounds of a busy urban street fill the theater. Horns honk, subway cars rumble and sirens sound. And when the curtain rises, it all makes sense. We're in the middle of an urban jungle, populated by a talented array of performers who present an astoundingdisplay of circus talents amidst construction sites, graffiti displays, and shadowy skylines. The very word "Cirque" sends a mental link to "Cirque du Soleil." In fact, both companies are based in Montreal. But while "du Soleil" performs in a gigantic tent and creates an ethereal world of fantastic creatures complete with their own language, "Eloize" sets its tale in a world that's far more realistic. These are street performers, delighting their audiences as the mammoth city grinds on in the background. Under the direction of CEO and Artistic Director Jeannot Painchaud, the performers include contortionists, balancing acts, skateboarders (Xuan Le), jugglers (Nicolas Fortin) and pole climbers, all displaying amazing strength and phenomenal talent. One incredibly flexible young woman performs the astounding feat of actually walking "around" herself. That's the best explanation I can come up with -- other than the fact that it made every bone in my back cringe. 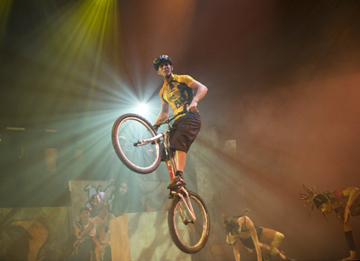 There's not a slow moment in the show, with the highlights including: the heart pounding first act closer that has the cast jumping rope in amazing combinations; Thibaut Philippe (top photo) on a bicycle, bouncing up, around and over various levels of the stage; Josianna Levasseur (at left), who spun and twirled around the playing area inside an oversized hoop; and an absolutely phenomenal showcase of trampoline work. Complimenting and adding tremendously to all of these segments are the phenomenal projections designed by Robert Massicotte and Alexis Laurence. Far beyond mere slides thrown up on a stage wall, these clever and artful video designs add motion in addition to defining the setting. The hoop sequence mentioned above was played out against visuals that sent the audience hurtling through the universe. And the trampoline performance, here called Trampowall, was presented amidst brick walls that appeared to collapse, reconfigure and float away with dizzying reality. The amazing sequence is the creation of designer Krzysztof Soroczynski. Overall, amazing dexterity, great fun, and a hot time in the city. "Cirque Eloize " is at the Citi Performing Arts Center Wang Theatre through May 15. For information, call 800-922-3772.